Lionel Messi has opened up on his obsession of winning the World Cup, claiming he doesn’t want to retire until he’s won the biggest trophy in football. 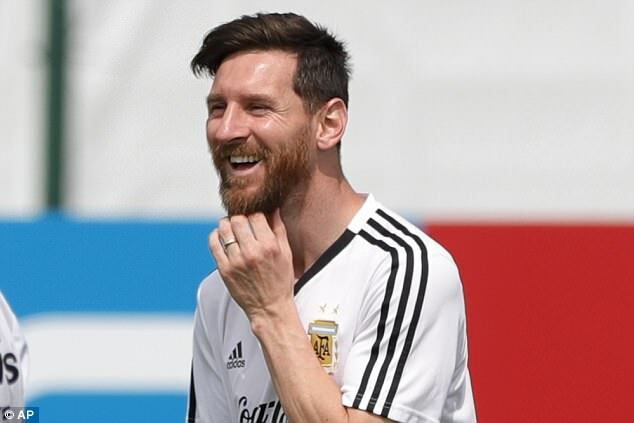 The Argentinian celebrated his 31st birthday on Sunday but insists he will not give up on his dream of bringing the World Cup back to Argentina. 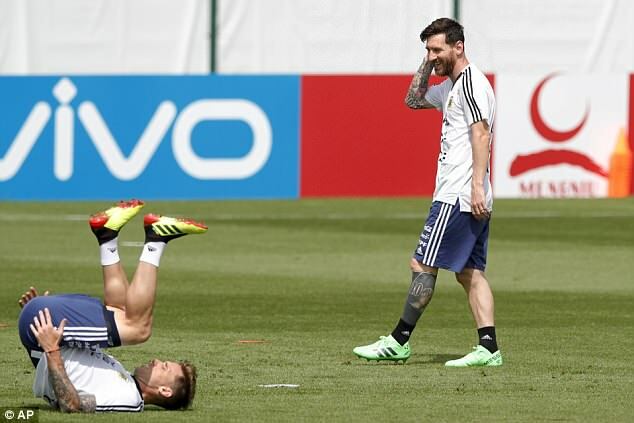 It was back to the drawing board for Jorge Sampaoli, who took a moment to wish Messi happy birthday at the start of the session, but the pair did not speak further. Sampaoli’s side have been handed a lifeline since they stumbled to a 3-0 defeat against Croatia, which had left them in serious danger of being knocked out. Nigeria’s win over Iceland threw the group wide open once again and Argentina must now beat the African side in their final group game to have any chance of progressing. Messi was reported in the Mirror as saying: ‘It means so much because for Argentina the World Cup is special – and for me too. ‘I’ve always had the dream of watching me raise the World Cup. And then seeing the emotion that goes with it. ‘My hair stands on end just thinking about that moment. It would make millions of Argentine’s in the world happy. ‘So we cannot give up on that dream. Despite some apparent animosity between Sampaoli and Messi on his birthday and calls for the coach’s immediate resignation, the Argentinian football association have backed Sampaoli for the time being – whose contract runs through to 2022 World Cup in Qatar. Tapia refused to answer any further questions. 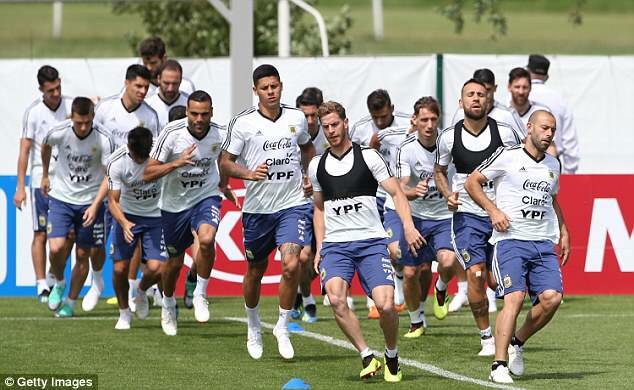 Argentina now face the task of beating Nigeria on Tuesday and hoping they are able to better Iceland’s result against Croatia, who have admitted they may leave out players on bookings. 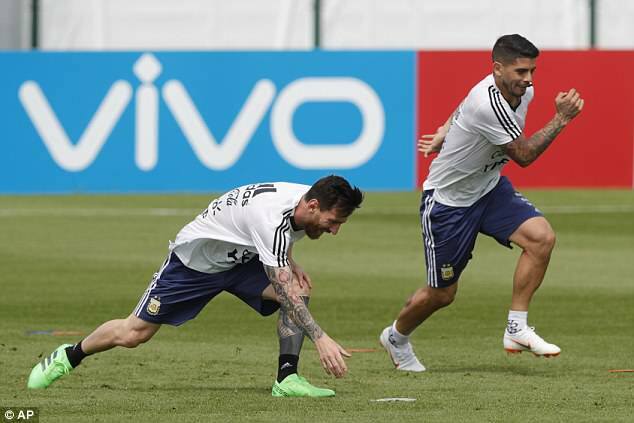 Argentina looked in good spirits as they trained on Sunday with a renewed hope among the squad. Despite a chaotic start to the tournament, the South Americans can still reach the knockout round, where they would play the winner of Group C, currently led by France. If Argentina fail to win the World Cup this year, Messi will have to wait until 2022 to have another crack – where he will be 35.